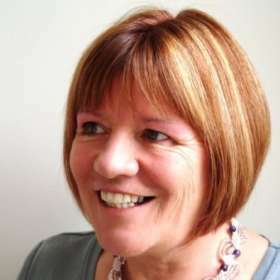 ‘in August I decided to make everyone I love a gift for Xmas but in November I decided I only loved one person’…. It was funny, and it had tickled me when I read the joke on Facebook, but now my friends are gauging how much I love them by whether they have a hand made gift for Christmas or not! Me and my big mouth! These are three lovely friends that I left behind when I moved from Birmingham nearly 4 years ago. We have been colleagues and good friends for over 25 years and still meet up regularly to do special things, including a big Xmas celebration. It’s like we need to meet up in order to get a fix of fun and laughter. So after the joke back-fired I got my thinking cap on about what I could make that they would like. I do like to personalise things so I started with Sarah. It was at her 10th wedding anniversary ‘do’ that this conversation took place. 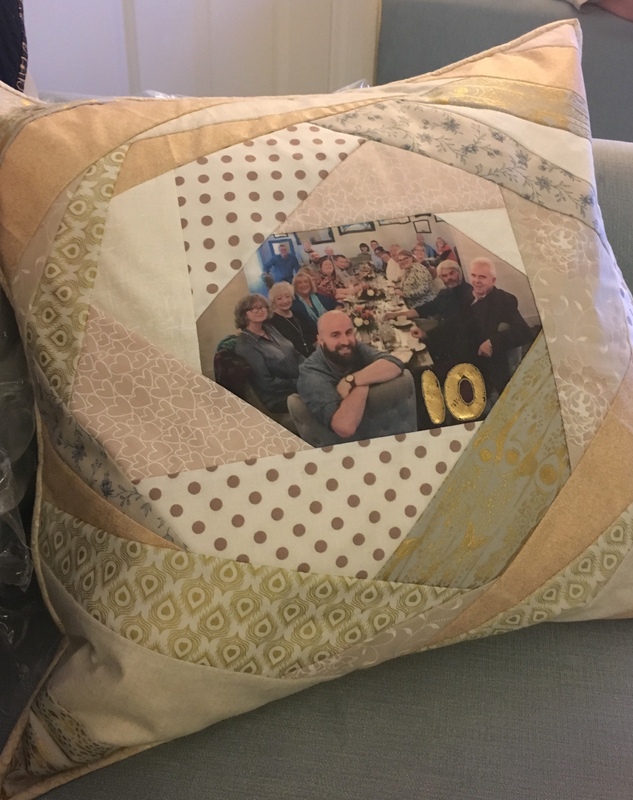 Someone took a lovely group photo of her friends and family at the restaurant so I decided to make this a focal point of a cushion; something to remember the day by. The photo was printed out on my HP printer on pre-prepared A4 fabric sheets. I love crazy patchwork so I found lots of of creamy fabrics that would work well in her lounge and set to work. I decided to add a number ‘10’ for the years she has been married and used foil to add a little something extra to the cushion. This is also relevant because we were her ‘maids’ at the wedding. A memory cushion that I hope she will enjoy. Well the next friend to consider was Pearl who belongs to a choir so the song that always springs to mind is ‘Pearl’s a Singer’ (heck isn’t that cheesy!). I love that song and we often play it at our Ukulele jamming sessions. 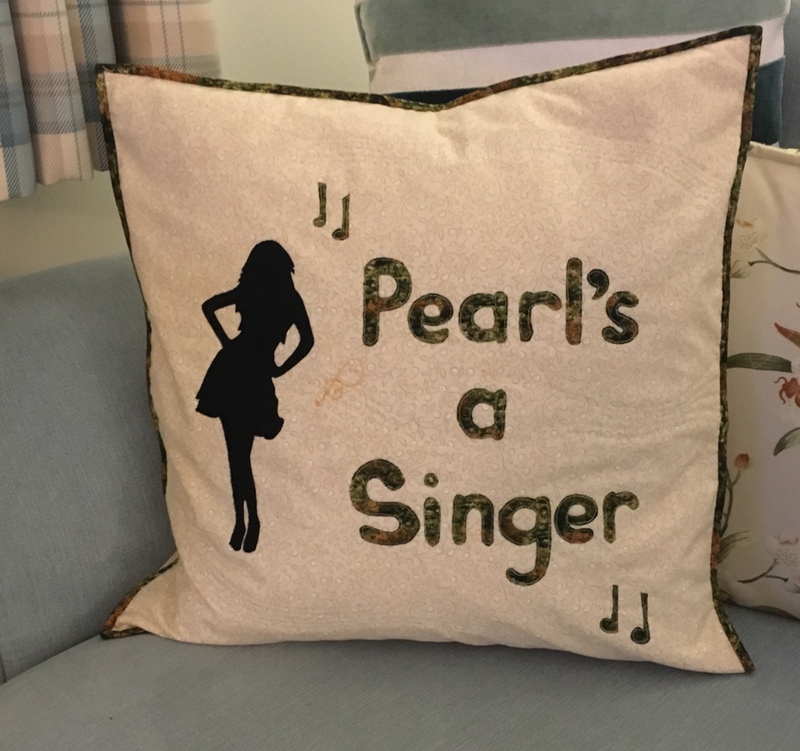 She is a lovely youthful 70 year old so I decided to do a second cushion featuring a silhouette with the personalised song title. The lettering was a challenge as I needed to draw the words freehand then reverse and copy onto Heatnbond. Even after a lot of care and concentration I still managed to put the ‘a’s on back to front but a little heat from the iron released them so I could re position. You learn by your mistakes don’t you. This was such fun to do and I am hoping she will like it. Now my friend Maggie reached 70 this year and I made her a ‘Bliss Pillow‘ which I blogged about recently so making another cushion for her was out of the question. 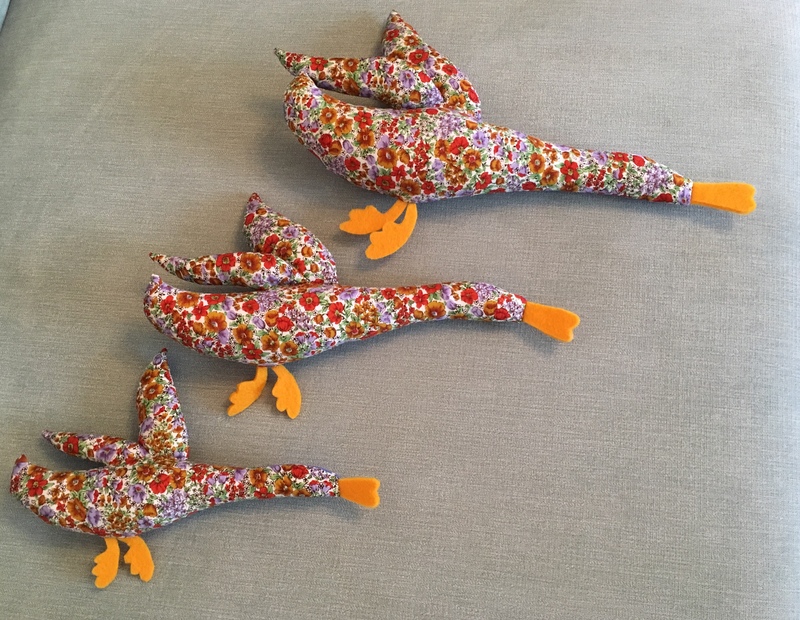 I did, however, want to make her something fun and I had a kit for three flying ducks which I bought some time ago (from The Makery). They are the same sort of ducks decorating the Mural on Hilda Ogden’s wall in Coronation Street many years ago (or Muriel as she liked to call it). Some of you will remember them; I am sure. Is it a cheat to use a kit for a gift? I didn’t think so, so I went ahead and loved them so much that I will be making another set for my garden room. Anyway I hope she will laugh and enjoy them over a glass of wine I shall add to the gift bag. Originally I was going to make my friends gifts but then I felt overwhelmed by the time I thought it would take. Having been pushed into it by my ill timed joke I am now happy that I made the effort. What has been your inspiration for gift making this Xmas? Thanks Ami. I enjoyed making them after thinking it would be a chore. Merry Xmas to you Ami.